What Else Can I Expect From an Online Doctorate in Healthcare Administration Program? Until the 1990s, healthcare professionals interested in postgraduate education were limited to either a master's degree or an academically focused Ph.D. While a master's in healthcare administration proves a worthwhile post-baccalaureate degree, healthcare now demands practical expertise, too. The doctorate in healthcare administration (DHA) serves as a terminal degree that emphasizes these practical skills. According to the U.S. Bureau of Labor Statistics (BLS), the medical and health service managers field should grow by 20% between 2016 and 2026. This number reflects the changing, multidisciplinary role of healthcare administrators. An online doctor of healthcare administration program blends organizational business practices with knowledge of the healthcare system. Graduates work as experts in their field and prepare for leadership roles in an emerging healthcare landscape. Management professional in healthcare who want to balance running a business with caring for patients should read this guide to DHA online programs. The healthcare industry continues to change at an unprecedented rate, and effective leadership in this dynamic environment calls for business knowledge, agile thinking, and a willingness to innovate. An online doctorate in healthcare administration delivers interdisciplinary subject mastery and practical expertise in the field. The leadership training in these programs helps you assess and improve your own performance, while the critical and analytic skills move your organization forward. Most doctor of healthcare administration programs require significant work experience for admission. Applicants typically need at least five years of management-level experience in healthcare, public health, or public policy. CAN I WORK WHILE I COMPLETE MY ONLINE DOCTORATE IN HEALTHCARE ADMINISTRATION? Yes. In fact, most online doctoral programs in healthcare administration cater to nontraditional students with full-time jobs. WHAT ARE THE ADVANTAGES TO EARNING MY DOCTORAL DEGREE ONLINE? Online doctorate in healthcare administration programs assume that their students work full time. Students manage their online coursework at their own discretion, while intensive face-to-face seminars often occur on weekends. Some schools even organize residencies in kid-friendly locales to accommodate parents. Aside from flexible scheduling, some DHA degrees online grant class credit for professional credentials or prior work experience. They also offer extensive student support programs, including online mentoring, advising, and study groups. Established in 1892 as the world's first osteopathic school, A.T. Still University maintains campuses in Missouri and Arizona. This private institution also offers a doctorate in healthcare administration online for seasoned healthcare professionals looking to advance their careers. The program comprises 42 credits, which typically take three years of full-time study to complete. Recognizing that many individuals choose to work while enrolled, ATSU provides maximum flexibility by ensuring learners never need to visit the campus to earn a degree. Course topics include quality improvement and performance excellence, healthcare economics and financial management, strategic change management for healthcare organizations, and healthcare organization informatics and governance. Learners complete all coursework requirements during their first two years of study. The final year includes researching and writing an extensive dissertation on an approved topic. Upon graduating, ATSU alumni may go on to roles as chief financial officers, health insurance administrators, medical directors, directors of patient safety, and healthcare consultants. Others might decide to pursue academic and/or research posts. Regardless of where they live, all students pay the same tuition rate, plus a $32 technology fee per credit. Learners must demonstrate a 2.5 GPA or higher in previous studies for consideration. ATSU holds accreditation through the Higher Learning Commission. Central Michigan University's Global Campus offers a doctoral degree in healthcare administration online for professionals already working in the field who want to expand their knowledge in leadership, policy, economics, delivery systems, communication, change management, and research methods. The program comprises 63 credits and takes 4-5 years to complete. CMU offers coursework in a hybrid format, meaning learners complete 51 credits through online methods but must come to the Mount Pleasant campus for six in-person seminars. Seminars last 2.5 days and focus on specific subject areas taught by qualified faculty. Learners must also visit campus to complete the comprehensive exam at the end of the program. This option exists as a cohort, meaning students enter the program with a set group of peers and progress through coursework with the same people until degree completion. If an individual does not get accepted initially, the department maintains a one-year waiting list and notifies individuals when they can begin with the next cohort. Topics include leadership strategies for healthcare policy and organizations, quantitative analysis in health organizations, health systems thinking and practice, and fiscal responsibility and accountability in healthcare. Applicants must demonstrate at least three years of healthcare-related work experience to qualify for admission. CMU maintains accreditation through the Higher Learning Commission. 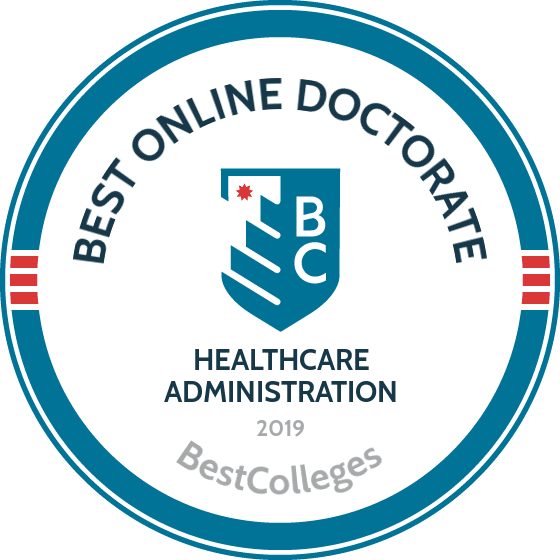 Founded in 1902 to provide top-tier education for adult learners, Franklin University in Columbus, Ohio, offers a doctorate in healthcare administration online. This fully online program allows distance students to complete two years of coursework before spending their third and final year writing a comprehensive dissertation. Individuals who have already completed some credits at another school can transfer up to 24 credits of approved coursework, making it easy to finish their education at Franklin. All courses take place in asynchronous format, allowing professionals to continue working while enrolled. The school also prizes individuality, allowing degree seekers to personalize their degree with a variety of electives. Enrolled learners complete 58 credits that divide into 16 credits of research, 20 credits of major classes, 10 credits of dissertation requirements, and 12 credits of electives. Core topics include advanced health information governance, advanced quantitative/qualitative research and design, advanced clinical workflow and applications, and advanced healthcare analytics. Regardless of their location, all learners pay the same tuition rate. To receive their degree, students must maintain a minimum cumulative 3.0 GPA throughout the program. Upon graduating, alumni go on to exciting roles as professors, consultants, C-level executives, and adjunct faculty. Franklin University maintains regional accreditation through the North Central Association of Colleges and Schools. Although the University of Mississippi hosts its main campus in Oxford, distance learners enrolled in the doctoral degree in healthcare administration online complete their studies through the University of Mississippi Medical Center in Jackson. Degree seekers can complete this immersive program mostly online, with minimal mandatory campus-based meetings. The curriculum requires three years to move from matriculation to graduation, with summer classes required each year. Core coursework covers topics like communications in health organizations, fundamentals of applied research, current trends in accreditation and licensure, and leadership strategies in health entities. Students use the fall semester of their third year to develop a doctoral project proposal and the final spring semester to complete all requirements. Individuals move through coursework as a cohort. While enrolled, distance students must maintain an overall cumulative GPA of 3.0 to remain in good academic standing. They must also possess a master's degree in a health-related field with a 3.0 GPA to apply. Alternatively, learners can apply with an unrelated master's degree but must possess at least five years of experience in a health-related profession. All applicants must provide GRE scores. Regardless of where they live, all online learners pay the same tuition rate. Applicants must send all information and forms by February 1 for consideration. Ole Miss maintains regional accreditation through the Southern Association of Colleges and Schools Commission on Colleges. As one of the three oldest public institutions in the U.S., the University of North Carolina at Chapel Hill has served learners since 1795. As the flagship campus for the 17-member UNC system, UNC-Chapel Hill serves nearly 30,000 on-campus and distance learners annually, including those seeking a doctorate in healthcare administration online. The Gillings School of Global Public Health hosts the executive doctoral program in health leadership for students near and far. Completing 45 credits, most online degree seekers move through all requirements in three years. Applicants to this program must possess at least five years of substantial leadership experience in mid- to senior-level healthcare positions. The program maintains an enrollment of approximately 1,600 students at any given time, with 72% identifying as female and 16.3% identifying as underrepresented minority learners. While the majority of coursework takes place in an online format, learners must visit campus during the fall, spring, and summer semesters of their first two years of study. These visits typically last 3-4 days. Learners must submit their applications by January 8. Prospective students should include evidence of a graduate degree and work experience, proof that all prerequisite requirements have been met, GRE/GMAT scores, transcripts from all institutions attended, and three professional letters of recommendation. A telephone interview is also required. UNC-Chapel Hill maintains accreditation through the Southern Association of Colleges and Schools Commission on Colleges. Each doctorate in healthcare administration online designs its own curriculum. However, the curriculum content and program structure receives oversight by the industry's accrediting body, and therefore schools generally offer similar content. Read on for our breakdown of a typical DHA degree online. Doctorate in healthcare administration online programs serve as terminal degrees that propel graduates into the upper echelons of the healthcare industry. Because of this, applicants can expect a rigorous application process. All programs require a bachelor's degree, and many expect learners to possess master's-level credentials in a healthcare-related program. Some admissions panels seek applicants with healthcare experience, while others require several years of work experience, regardless of industry. GPA requirements vary by school, but most require at least a 2.5. However, those with lower GPAs may make up the difference with professional experience or a personal essay. Most online doctoral programs in healthcare administration do not require GRE scores, but international students must provide passing scores on the TOEFL or IELTS English proficiency exams. Marketing and Communications in Healthcare: This course reviews marketing, communications, and public relations principles, with a specific application to healthcare administration. This includes health literacy promotion, culturally appropriate message delivery, health services marketing, and ethical practice. Leadership in Public Healthcare: An introduction to leadership theory, descriptive and prescriptive systems, and public health leadership principles. Students strategize the most efficient uses of the resources available within healthcare systems. Governance for Healthcare Leaders: This course examines policy, law, mandates, advocacy, contracts, and ethical obligations of leaders of healthcare organizations. Students approach hypothetical and real-world situations from economic, political, and sociological perspectives. Advanced Healthcare Analytics: Analysis of the retrieval and reporting processes of data-driven healthcare management. Students refine database skills, including extraction, transformation, and analysis within corporate data warehouses. Advanced Healthcare Informatics: An introduction to issues surrounding health information resources at the institutional level. Students use national initiatives to develop and implement informatics technologies, particularly in clinical applications such as electronic patient records, digital prescribing, disease management, and provider order entry. Special topics also include strategic IT systems planning and the role of management in major IT implementation. HOW LONG DOES IT TAKE TO GET AN ONLINE DOCTORATE IN HEALTHCARE ADMINISTRATION? It can take 3-7 years to complete an online doctorate in healthcare administration, but completion time changes depending on several variables, including your educational background and individual program differences. As a rule, a full-time doctoral student should expect to spend a minimum of two years completing 50 credit hours of coursework -- and roughly two more years completing a dissertation. Students can accelerate this process in some programs; for example, students who hold a master's in healthcare administration may complete coursework faster than those who hold a master's in another discipline. In other cases, some DHA online programs begin the dissertation process before learners complete the coursework, allowing students to get a head start on their project. Most degree candidates progress through the program in cohorts and begin and end coursework with the same group of peers. Leadership: Because healthcare administration executives take on senior-level roles, understanding how to lead and motivate others proves critical. Students learn about leadership methodologies and ideologies to discern which fits their style best. Relationship Building: Working in healthcare administration requires professionals to build relationships with stakeholders inside and outside the healthcare industry. A doctoral program teaches them how to build bridges. Healthcare Administration Software: Because technology plays an important role in healthcare administration, senior leaders must know how to deploy these tools to help companies run smoothly. Teaching: Doctorate in healthcare administration online degrees qualify students to educate the next generation of professionals. Students gain skills related to creating curricula, lecturing, and advising learners. Consulting: While some graduates work for one company, others decide to provide consultative services to multiple healthcare companies. Degree seekers learn how to identify issues and provide creative solutions. To graduate, students enrolled in doctorate in healthcare administration online programs must complete a culminating project to demonstrate what they learned. Some departments require a capstone or practicum, but most require a dissertation. Degree seekers research a topic intensively by collecting independent research, conducting studies, or interviewing relevant parties. After conducting research, students use this information to write their dissertations. They must also pass a comprehensive exam and take part in an oral defense of their dissertation. Accredited academic programs undergo a rigorous examination of their curriculum and admissions procedures by a neutral third party. This process ensures that schools meet high academic and admissions standards. Schools and programs receive national, regional, or programmatic accreditation -- or a combination of all three. Each accrediting body uses different criteria to evaluate a school. National: National accrediting bodies focus on vocational education. Distance learners are best served by schools that hold national accreditation by the Distance Education and Training Council Accrediting Commission. Regional: Regional accreditation usually carries more weight than the others, because it evaluates a program's academic rigor. Programmatic: Programmatic accreditation focuses on accrediting programs and schools for a specific field of interest. For a doctorate degree in healthcare administration online, the premier accrediting agency is the Commission on the Accreditation of Healthcare Management Education (CAHME). CAHME established clear standards on DHA curriculum content and design, school resources, career development resources, and the performance record of program graduates. Though the government does not grant accreditation, the U.S. Department of Education oversees the accreditation process and maintains a database of accredited schools. The Council for Higher Education Accreditation is an independent association of accredited degree-granting institutions that also provides oversight to the process, and they also offer a database of accredited schools. Graduates of online doctorate in healthcare administration programs can attest to the value the degree adds to their careers. The list below includes testimonials from healthcare professionals with an experience of benefiting from this degree. "I would highly recommend this program for leaders who want to augment their professional skills and drive their level of excellence in healthcare management to a new level. It is clear to me that the DHA degree will set me apart from my peer group as a contemporary leader in the healthcare community and position me for greater personal and professional achievements in the future." "The online format was challenging, vastly interactive, and emphasized both theory and practical application... I would highly recommend the DHA program to any healthcare professional who wants to accelerate their career to a premier level." "The doctoral academic roadmap, which culminates with the dissertation process, has allowed me to attain better critical and systems thinking skills, ultimately making me a better healthcare leader. The networking opportunities among student executives and experienced academic staff have opened the doors of opportunity for advancement within the healthcare industry… I firmly believe that the decision to enter the DHA program has made me a better healthcare professional and expanded my prospects for future employment." Because the doctorate in healthcare administration is a relatively new academic discipline, data on the salaries of its graduates is still being gathered. For this reason, there is not yet a quantifiable return on investment that DHA degree candidates can expect. However, the BLS does offer significant projections on the future of the healthcare industry, which can offer useful information for prospective online doctorate in healthcare administration students. The BLS projects that medical and health services managers positions will grow 20% between 2016 and 2026. The BLS also aggregates data on the salaries and employment opportunities for medical and health services management professionals. The table below illustrates BLS data on the top five metropolitan areas in the U.S. with the highest employment level of medical health and services managers. Online doctorate in healthcare administration programs help working professionals in the healthcare industry with at least five years of management experience. These students usually work within defined career paths, and the DHA provides academic credentials to further establish themselves as leaders within their healthcare organizations. The degree also opens several paths for career advancement, including positions at the highest level of healthcare administration. Many graduates hold executive titles such as vice president, chief operating officer, chief financial officer, chief executive officer, or health system president. In an industry beset by changes in political, legislative, economic, and patient-centric areas, DHA graduates lead organizations that deliver high-quality care at the lowest possible cost. Membership in professional organizations proves invaluable, as it promotes interaction with peers in the field. With an annual membership, an individual receives subscriptions to industry publications, invitations to annual conferences and other networking events, and continuing education opportunities. Student membership is often discounted and can provide useful insider information like access to job boards and professional networking. The list below includes a few of the major organizations dedicated to healthcare administration. This national professional development association operates 78 local chapters and offers member benefits that include professional certification, a range of publications, leadership development programs, and special interest groups. With memberships available at the student, professional, and organizational level, this organization works to enhance optimal medical practice performance. It makes training, continuing education, and certification available to professionals, and it offers regulatory and legislative news and analysis. Emphasizing career development, ACHCA operates through local chapters divided across six districts of the U.S. Member benefits include annual conferences, local networking events and seminars, continuing education opportunities, professional certification, and a mentoring program. The HFMA focuses on professional development and networking for healthcare CFOs. Members benefit from local chapter events, national conferences, webinars, CPE opportunities, certification programs, and a vetted vendor directory. This long-standing professional organization improves the industry through political lobbying, public policy influence, and advocacy. Membership ensures that your voice matters. Before you sign up for a DHA degree online, complete the FAFSA to learn which federal funding opportunities you can access, such as scholarships, loans, grants, and work-study. You may also qualify for externally funded scholarships from private foundations. Approximately 66% of today's college students rely on loans to fund their education, but students can use other options to reduce their overall student debt. Completing the Free Application for Federal Student Aid (FAFSA) proves a crucial first step for any student with financial needs. Our FAFSA guide features a step-by-step rundown on the process and answers to several frequently asked questions. Financial aid for online learning is equivalent to what you will find for campus-based learning. Follow this link to see what online funding you can access. Online college programs can serve as a flexible, affordable option for single parents interested in earning a degree and securing their family's financial future. This list of scholarships, grants, and other financial aid options caters to single moms and dads.